His two grandkids laughed. Grandpa had given his coffee cup a face. “So what name do you want to call her?” Riley put extra emphasis on the “her”. The kids got suddenly silent. It had been two weeks since his wife left to stay with her sister and “rethink” their marriage. “Yeah when, Grandpa?” Riley added. “Tonight I’ll call her and say I miss her too.” Riley and Shelley cheered. I wrote this for the FFfAW Challenge-Week of September 26, 2017. The idea is to use the image above as the inspiration for crafting a piece of flash fiction between 100 and 175 words long. My word count is 168. Things are fine at home, thanks. This isn’t about me or anyone really. I’m just aware how my grandchildren miss their Bubbe (Yiddish for Grandma) when she’s not around and thought I’d increase the tension a bit. 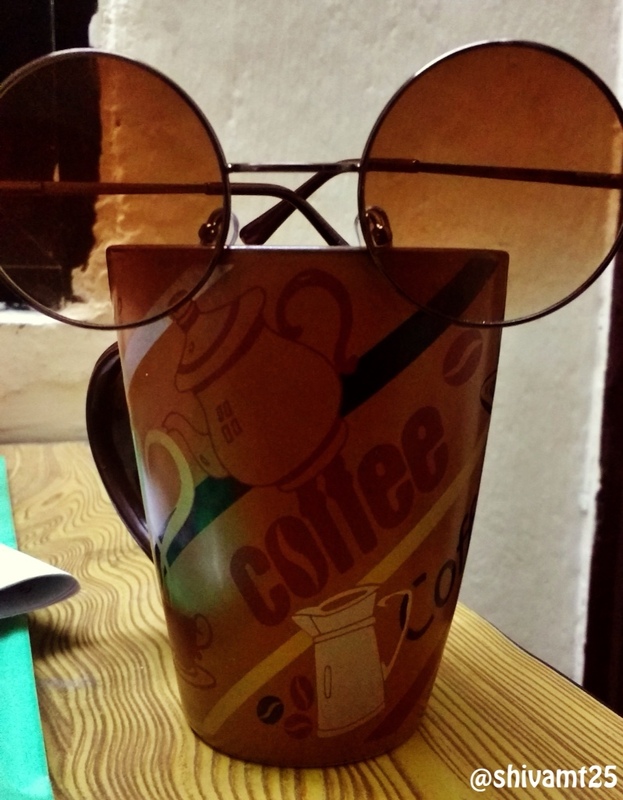 Besides, the coffee cup and sunglasses does kind of look like a face. Loved the image of children teaching grandad to say, I miss you. It’s a lot easier for kids to say that sort of thing sometimes. Children come without any baggage. Nice story, James. They only have the baggage we give them, at least when they are children. Thanks, Neel. I hope he manages to get Bubbe to come back, for his sake and the children. Oh I’m sure she’ll be back, Iain. Thanks. A really touching and beautifully written story. The boy v girl difference of opinion about gender possibilities is spot on. One complaint though – it’s not fair to give an old man a tear in his eye at this time of day. Life isn’t always fair. Thanks. I almost killed her but that would be too cruel. The children would miss her terribly. Wonderful story James! I love the innocence of children and you have woven that into your story. Love the ending too! I half expected some drone or android to make its grand entry into the story. A very different story from you, James. I quite enjoyed it. That would be fun but somehow I think the kids would be able to tell the difference. I could hear them talking! Simply brilliant. So can I. Thanks, Keith.